Back in 2003 we took a grown-up’s ‘gap-year’, leaving work behind for 12 months, shipping our motorcycle to England and riding home through Europe, the Middle East and Asia. This ride took us along the Dalmatian Coast and through Iran, Pakistan, India and Nepal. 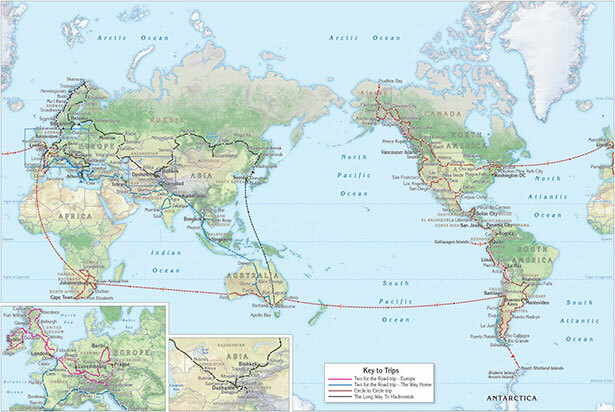 Since that time we’ve ridden more than 170,000 kilometres through 68 countries over six continents. 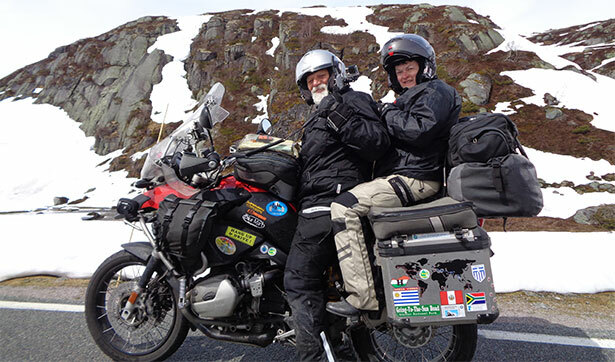 In 2011, when Brian retired we hit the road again, this time shipping our bike to Chile and heading to the bottom of South America and then turning around and heading to Prudhoe Bay, the northern most tip of North America. That wasn’t enough. Rather than sending the bike home we flew it to Europe and then South Africa to explore more of this wonderful world. Fast forward to 2015 and there was a gap in our riding experience – right across Russia. So we were off again, shipping the bike to Greece. For the next six months we rode through Europe to Scandinavia, making it to the very tip of Norway – Nordkapp. From Scandinavia the road took us to Russia and the ‘Stans’, leading us along sections of the old Silk Road and into Siberia. 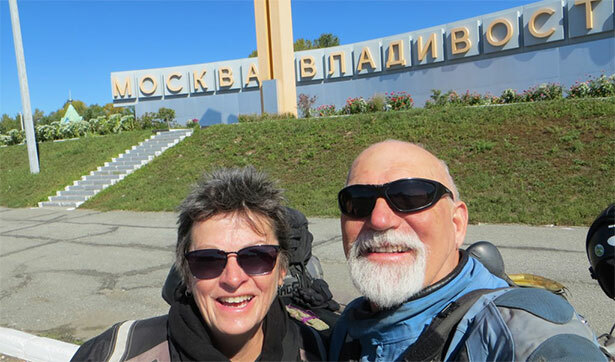 You can read highlights of our journeys in posts on this web or in more detail in our books – Two for the Road, Circle to Circle and The Long Way to Vladivostok. We hope we inspire you to hit the road, or just sit back and ride with us, enjoying the ride vicariously. Read your Northern Lights in Jan 2016 Motorcycle Treader given by Peter Charles West who travelled in 1976-77 overland from Australia to UK on an XL 250 Honda whom I met in India.I travelled overland on a motorcycle to Europe from India and also rode up till Nordkapp in 1978. Great reading your article which brought many great memories back. You are most welcome to come over to Chandigarh India when you visit India next. Keep riding. Shirl Hard!!! Are you mad!!? How do you power the TV on the road? How do you cook Beef Wellington on a bike? Where’s the concrete in your travels – there’s nowhere more adventuresome than being surrounded by concrete and a lovely chlorinated pool. So many questions…?? Keep going – until I get a SUZI replacement, it’s the only way I’ll be travelling on a tourer bike. Enjoy and make me jealous. James (now 7) keeps telling me that he’s going to ride around the world with me when he’s old enough – bring it on! Hi guys – thank you for a great read and all the great ideas. I look forward to meeting up with you both in October, here in QLD. I met you recently on a BMW club ride to Castlemaine. I was the one on the yellow R1150gs It turns out that We have some mutual friends including My late Father. I was unaware when I met You that You are a Police Member as was My Father. Not long now. I hope the border crossings in Australia are a bit simpler than the last years. Hello sore bums. My BM’S are stuck in the garage, bloody work. If you ever get back to Aus let me know your mailing address and I will send you a copy of the WAPU Centenary Book Fruits of our Labour. G’day Rixy and Shirley. Not jealous at all!! Hope you are both well and enjoying the world. I tried to talk Stephen into taking the Enfield on the wall to wall ! No luck there. Catch ya when you get back. It was wonderful getting to know you at Horizons Unlimited’s travelers meeting. How cool that friends from around the world can converge in a farmer’s field in Barrie, Ontario! Thanks for your inspiration and friendship! Safe adventures! Brian Rix & Shirley Hardy Rix With Darren James of Radio 3AW Melbourne. Suzanne ran into our bedroom this morning and said Rixy was on the radio. Suzanne has been enjoying listening to Shirley talking to Red Symonds during the morning radio program and keeps me updated about your wonderful adventures. We have both recently obtained our motor cycle licences and one day may be able to take a ride with you both. It is great to hear that you are having such a fantastic experience. Safe travels and look after yourselves. Brian Rix Shirley Hardy Rix Valdez Alaska 19/8/12 with Darren James of Radio 3AW Melbourne Australia. We are thoroughly enjoying your regular reports. Hear you had a meeting with a grizzly. At least you could ride away. Shaddy says she has to live with one. I so enjoyed coming back to my GSA in the Seattle ferry line and finding yours, then guiding you to see Chief See-alth’s grave and the rebuilt longhouse and totems where his Suquamish people still live, with a beautiful view of 14,400′ Mount Rainier (known as Tahoma or Tacopid by the First Nations peoples meaning “She who gives us the waters.”), by this part of the Salish sea now known as Puget Sound. Have a good coffee and meeting with Greg Neufeldt in Victoria This Morning. My Friends, Jack, Steve and I met you at the Cascadia Inn Cafe, Skykomish,Washinton, today 1st of July. I had the White/Black Victory. Was Great meeting and chatting with you. Would appreciate it if you could give me the times and stations for your broadcast again, so I can have my friend tune in. Thank you and have a wonderful trip. You can hear aussies overland on http://www.3aw.com.au/ with Darren James Sunday mornings between 9.30 & 10.00 am usually @ 9.45 am Melbourne Australia Time. Howdy! great meeting you at Tynda, offer stands always to stay over on your way up or down the coast. Sounds like you are having a ball (again!) Can’t wait for the next book. feel free to email if you need anything when passing through Redding, CA area. Met at the Vagabond in Bishop inflating my brother’s truck tire. It ocurrs to me that I am in Petaluma, Ca until early AM of 6/25. Petaluma is about 40 miles North of San Francisco on Highway 101. Don’t hesitate to contact me if you need a meal or some assistance. Nice to meet you folks. VC should be interesting. Boom town gold mining places are yet another thing Aussies and Western Americans have in common. Sorry to interrupt your dinner; but hey, we had fun. Our hopes are with you for a safe trip. To my new friends from Australia…..
As you may have guessed this is Ron from that little old watering hole called The Stagecoach Inn, Aguanga California.I hope those travel sites I recommended to you work out as planned. I just want you to know that your names came up today and we toasted to your safe journey around the world. I want you to know that after you left, some of the people are now speaking a different language at the bar. Now they walk around and say ” No Worries mate, good day”. Now my Australian hat is more fashionable at the bar. Have a safe trip, I know you will, cause your a critical thinker mate. When you make it to British Columbia, send me a note…I would be honoured to show you around Vancouver Island a bit..it is a great place to see…. Forgot to mention that I live in Victoria, here on Vancouver Island. It is only a 1.5 hour ferry ride. There are three ferries, the one to catch is Tsawwassen to Swartz Bay, best for scenery through Active Pass. just got your message on Horizon’s, hope we can meet you guys along the way. Like others we’ve been following you on 774. We will be in Seattle (11/5)and heading to Denver via Rocky Mountains 16/5 to 3/6. Wondering if our paths might cross – would be kool! It was great to meet you at Tijex. I wish you all the best on the rest of your adventures. May your roads be smooth and your beer cold. Hello Shirley and Brian, I am enjoying following your travels via Red on 774. Thinking about you today, we had the kids at school singing “From Little Things” and they were retelling the story in their own special way. Might be something we can build on, upon your return. Hi from Tas guys! Can’t say how envious I am, glad you guys are enjoying it and thanks for sharing it with us on the way! Hope to catch up when you return, don’t rush though! Take care, Justin + Kate. Just heard Shirley on 3LO with Red. Pages like yours are addictive. There are so many people living their dream by motorcycling across parts of the world. Enjoy your travelling and create memories for the future. I’ll follow you now. Last time I caught up with you was when you had just returned from your last jaunt. Glad to see you are still as outrageous as ever. I retire in a couple of years and will probably do what you are doing but in a van. I spent time in the States teaching and drove through nearly every state in a Chevy van (Canada too). Loved that freedom. Enjoy your journey! I heard you on the wirelss – it was wonderful. I am so envious. Enjoy! The crooks in Melbourne are having a wonderful time not that Brian’s not chasing them. Don’t like reading all this…. You are having too good a time. Thanks guys for making it hard to convince CMcP 4WD trip with me would be the best way to travel. Brian and Shirl, Hope you had a great and enlightening Christmas and New Year experience over there in SA. Stay safe and “ride with pride”. Brian and Shirley, You can get the tyres in Rio Gallegos. If you enter the town from ushuaia and drive straight into the town on the left side there are two shops. Both of the same company. They do Honda yamaha. Good Shop. Have a nice ride. Merry Christmas & Happy New Year Brian & Shirl, Good to see the trip is going well. We all miss you here in Melb. If you come through Victoria, BC on Vancouver Island be sure to look me up and I will take you for a ride through some nice areas here…. Brian and Shirley 🙂 I’m the girl you met in Punta Arenas in the tour to the pingüineras! Now I’m home in Guadalajara, México. I was studying in Santiago the last semester and I fell in love with Chile. It was for me the last trip before I had to come back and I had the best time. Now I can say that just when you think that you are traveling alone, it’s when you end up not alone at all. That the people that you meet while you travel are the ones that mark your trip somehow. Your story and dreams that you are making true are inspiring, I’m sure that you will have the best time and you will spread your commitment and courage to many people. Good luck, I’ll be checking how your trip it’s going. A big hug from Mexico :), Cynthia. finally some news from the two Germans Klaus and Tim … We made it to Ushuaia and are now already back home after some days in beautiful Santiago. You must have reached the end of the world by now, I suppose, and get ready for Christmas and New Years. We wish you save travels and always a piece of good salmon on the way (as good as the one in La Junta were we had the pleasure to spend a wonderful evening with you). Hope to meet you gain some time! Great to hear everything is ticking along – it sounds almost as exciting as life here in Toolamba. Maybe catch you in Texas. Keep safe. just rode the harley across the nullabor , pert to melbourne, very iconic, did not realise that australia was so big! Our sons (Brad and Aaron) are also on motorbikes travelling through Sth America. Last we heard, they were travelling north, heading for San Pedro in Chile. If you see them, say hi. You never know – the world is not such a big place. Is this the correct place to post you a message? There is a petrol station in El Chalten across from the bus station. I saw a car filling up but no idea what the supply is like. I have been lstening to your calls through on AW. Stay safe and enjoy your adventure. hope all is well. Just Thinking of you both. Looks like an amazing experience. Good luck guys! Take care and have lots of fun. Just want to thank you for your support over the years. Looking forward to checking in every so often to seee where you are at. Love hearing about your travels through Brian and Darren James on 693 (3AW). Frank would be so proud of you, telling your story and doing what you want to do (“bugger the rest of them”). Have a great time and come back safey. Hi Shirley, Frank would be so proud of you, as you’re doing what you want to do and telling everyone about it. Hope you come back safely. Love listening to Darren James on 693. Great to hear the regular updates on 3AW with Darren James. Makes me want to fire up the single cyclinder GS and get out and about. Can’t believe you guys are well on the way. Pics and stories are great. I am jealous and so is my missus. Love to do it myself but think my Road King will need to be changed for something more practical. Enjoy the trip. Wish I was there riding with you guys. I’m green with envy. Hope this trip is as successful as the last one. Can’t wait for the book. Hey Shirley, how’s the navigation going? Hope you have another happy and safe adventure Brian, and we will see you in the west as you come through next time. Dear shirley and brian, Fantastic to hear you on Red’s program on 774 early this morning. I will be following with great interest your long journey and in the future look forward to another great book on all your adventures. Will catch up with you when you both return. Great to see your on way guys. The boys love hearing about your trip. We’ve got your map in the toilet. Can’t you take Nic Watson along. He NEEDS a tree-change! Looking fwd to following the journey, cant wait until my mid fifties…. not long to go…..
Well done guys. Watch out for Orange Penguins. Good to hear the update this morning with darren on 3AW. Looking forward to reading your tales tall over the next 18 months, keep living the dream. G’day Brian & Shirl, Simone and I wish you the best in your travels. Gone down the path of a GSA now and its time to take time. Good to hear an update on 3AW this morning with Darren James. Heard you this morning talking with Darren on 3AW. Your planned journey over the mountain that has exploded into a volcano gives new meaning to the saying “go with the flow”. Loved your first book, look forward to following this one, then hopefully read about it. Hope all’s going well so far and we’ll be keeping constant tabs on you! Had a great trip to Menindee Lakes in van. Stay safe and ENJOY! Hi Brian and Shirley, its Ness, (Frank Banghams sister) I will be following your trip, its a great thing to do.Hope everything goes well for you. Good luck. Hey guys, heard you today on 3aw. Hope you get your bike soon but sounds like you are in a nice part of the world anyway. It’s great Darren is supporting your adventure and we look forward to following your amazing trip. Stay safe. We’ll keep in touch. Smurf and Lisa. Heard you this morning talking to Darren James on 3AW.